As laughable as it may already seem after this morning's depressingly familiar headlines, this week was meant to represent a fresh start for former UFC world champion Conor McGregor. A bright new dawn finally free of the legal troubles that threatened to ruin his once dazzling career. Only a few days ago, the Irishman completed his court-mandated five days of community service after pleading guilty to a single violation of disorderly conduct in Brooklyn criminal court, last July. Two months previous he had been caught on camera — wild, wide-eyed and ranting — hurling a metal hand truck into the window of a charter bus full of his contemporaries at a UFC press event. As part of his punishment, McGregor worked at several Brooklyn churches among the desperate and downtrodden. He faced no jail time, was handed no criminal record, and his travel visa was not affected. Laughably, he was also instructed to attend an anger management programme lasting one to three days. With those commitments fulfilled, fans began to grow excited over his return to competition. A fight with long-term adversary Donald Cerrone was said to be in the works. A rematch with Khabib Nurmagomedov hovered lucratively in the distance beyond that. It seemed as though McGregor had been gifted yet another chance to prove that he still has an active career, as well as a storied history and tired lamentations of what might have been. These are the facts: on Monday afternoon, McGregor was arrested by the Miami Beach Police Department and charged with robbery and criminal mischief. 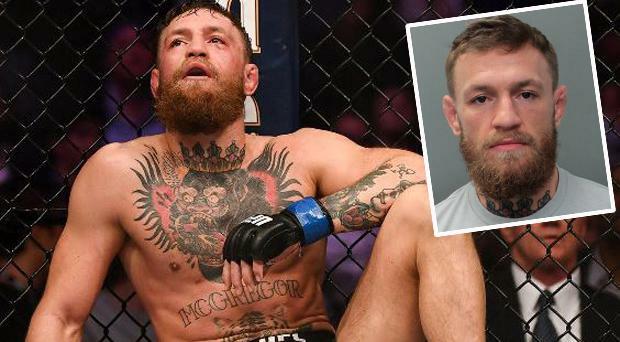 According to the police arrest report, McGregor and a 22-year-old man were leaving a nightclub when they became involved in a dispute over a photograph. "The victim attempted to take a picture of the defendant with his cell phone. The defendant slapped the victim's phone out of his hand, causing it to fall to the floor," the report reads. "The defendant then stomped on the victim's phone several times, damaging it. The defendant then picked up the victim's phone and walked away with it, depriving him of it. The defendant was located and arrested." Additional information is, at this stage, thin on the ground. We do not know whether the man had asked McGregor's permission or not to begin recording him or taking photographs. We do not know whether he was abusive or rude to McGregor. And we do not know for how long he persisted in attempting to interact with him. Rather remarkably it could have been even worse. If this incident had occurred just a week earlier, before he had finished completing his five days of community service at churches across Brooklyn, he would have been in violation of his probation. And that would have meant more than a slap on the wrist: there would have instead been a very serious fear of time behind bars and deportation. In the wake of that shameful incident last year, a stony-faced Dana White memorably muttered in a cleaning cupboard that the attack was "the most disgusting thing that has ever happened in the history of this company", promising dismal repercussions. But those never came. Instead, he merrily consented to using footage of the criminal act in various pre-fight promotion and something immediately became obvious: that McGregor was by now far, far too big to control. The real tragedy is perhaps that, once upon a time, McGregor was breathlessly proselytised as representing a new and confident Ireland. No more. The very thought seems sadly ridiculous. McGregor's is a stratospheric ego that grew first too big for his employers, then his sport and now the wider world around him. Perhaps he acted unnecessarily aggressively in Miami yesterday or perhaps he was baited into a reaction. Those famous victories in the UFC have never seemed so very long ago. And for a man who delighted in the extraordinary, now we all know exactly what to expect. Sadly, arrogance is a kingdom without a crown.